This component of the SCRI project allows the systematic study of the interaction between fertility and water management in almonds. Almond research conducted by Bruce Lampinen has demonstrated a substantial influence of water management on tree nitrogen nutrition. Studies have also demonstrated the usefulness of regulated deficit irrigation (RDI) for improving hull split and reducing hull rot in Almonds. One of the key elements in RDI is the use of a plant-based index of water status, and the most robust of these appears to be midday stem water potential (SWP). Our primary objective is to document the amount of water applied to the experimental plots of the fertilization management project, including the collection of data related to ETc, and to monitor the effects of the grower's irrigation management on tree SWP. ETc describes the movement of water within the crop plants from uptake by the roots to loss as vapor through stomata in the leaves. ETc calculations include crop and climate factors and evaporation from the soil. Water within the plant moves from the roots to the leaves through interconnected cells, the xylem. The water in the xylem is under tension, because it is pulled with suction force as it evaporates from the leaves. The tension increases as the soil dries. The Pressure Chamber (Fig. 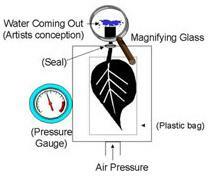 1) is a device for applying air pressure to a leaf. When mounted in the chamber, the amount of pressure required to cause water to appear at the leaf stem is called the stem water potential (SWP). A high value of pressure means a high value of tension and a high degree of water stress (operation details). At each of three sites, we installed water meters on two lateral irrigation lines, and also a pressure sensor instrument in one line with a datalogger which recorded system on and off times. 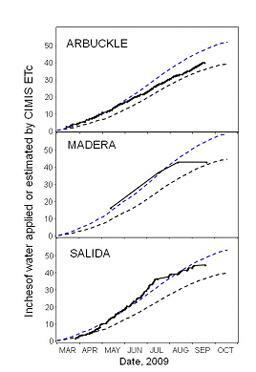 This information was used to document applications of irrigation water, which was compared to nearby CIMIS estimates of Etc. At monthly intervals, we sampled trees in the fertigation study for midday SWP, using the pressure chamber technique. Seasonal patterns for ETc and SWP are shown in in the figures below, for three sites. Fig. 2. Seasonal patterns for ETc. Fig. 3. Seasonal patterns for SWP. 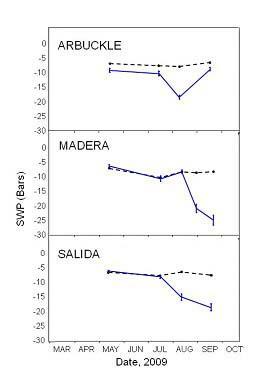 Evidence to date indicates that almond leaf stomatal conductance is very sensitive to SWP. 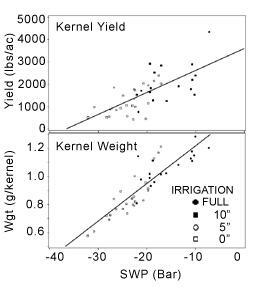 When SWP values were averaged over the growing season, there was a clear relation of both yield and kernel weight to SWP (Fig. 4). Overall, the data suggest that: 1) significant short term plant leaf and canopy ET responses may be occurring at these sites, and hence that 2) it should be possible to correlate remotely sensed canopy data to SWP. Fig. 4. SWP versus yield & kernel weight.